Executives at Samsung Electronics are extremely bullish about the prospects for 8K TV in the next few years, saying they expect to see accelerated sales and for the company to cement its leadership in the premium TV sector. Speaking at a media event in South Korea last Friday, Han Jong-hee, Samsung’s president in charge of the visual display business, pointed out that the company only launched its first batch of 8K TVs in November last year. Since then, the premium TVs have accounted for over half of its “large-sized” TV sales, the executive said. 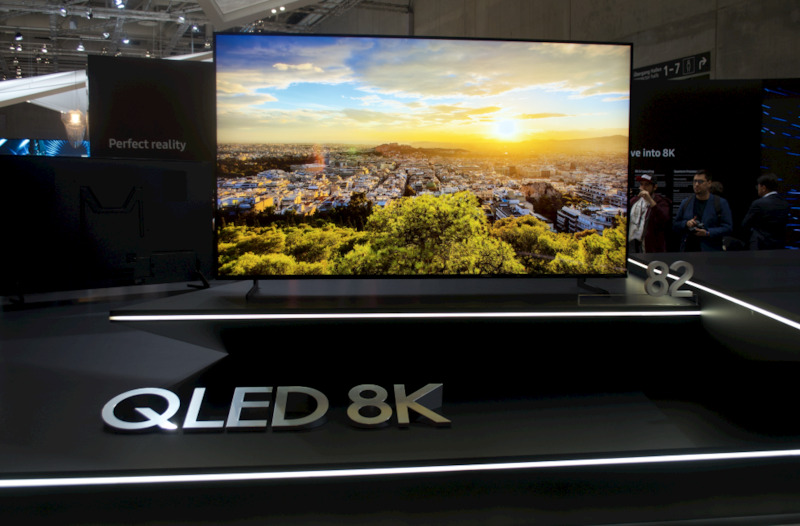 Samsung unveiled its first 8K QLED TVs at the 2018 Consumer Electronics Show, and has since made them available for sale in Europe, Russia, South Korea, and the US. Now, Samsung is ready to expand sales to Africa, Latin America and the Middle East. It plans to launch its 8K TVs in 60 countries in total this year. That follows the launch of various new 8K QLED TVs during last month’s CES show. However, Samsung faces competition from rivals including LG, Sony and various Chinese TV makers, who also released 8K models at the event. Samsung is planning to announce several new 8K Models for its 2019 lineup later this week at the Samsung Forum, an event that will take place simultaneously in various parts of the world. The company is expected to announce six size variations for its 8K TVs. The largest model in last year’s lineup was 85-inches, but for 2019, Samsung is also preparing to launch a 98-inch version. Han said at the press conference last Friday that the company’s aim for 2019 is for its 8K TVs to see double-digit sales growth. He believes the goal is “reachable”. Han’s view might be considered optimistic by some naysayers, who point out that very little 8K content exists at present, and that it will probably stay that way for several years at least. After all, even 4K content can hardly be considered the norm at this point. But Han said he was confident that things would accelerate faster than anticipated. Han cited the example of Japanese broadcaster NHK, which has set up an 8K satellite broadcast channel and also plans to cover the 2020 Tokyo Olympics in 8K. Han’s comments come at a time when Samsung is starting to feel the heat from its rivals. The company, which has been the world’s biggest TV seller for 13 years running, has seen rival LG chip away at its market share in the premium TV sector (those with screens of 65-inches and above) with its OLED TVs. But Samsung has been fighting back, and saw increased profits in its TV business in the fourth quarter of 2018 due to strong sales of its QLED models, which it says provide similar image quality to OLED. Samsung is also pushing its MicroLED display technology, which it says is “unsurpassable” compared to others. The company launched two MicroLED TVs at CES last month, including a smaller 75-inch model and a gargantuan 219-inch version. MicroLED is similar to OLED in that does not use a backlight. Instead, it uses inorganic materials that make it more durable as they eliminate the risk of burn-in problems which OLED has been susceptible to. Samsung is widely considered to be the leader in MicroLED technology at present, having significantly improved its manufacturing yield rates. LG meanwhile is ramping up its OLED push, investing millions of dollars to expand its production facilities in Guangzhou, China.